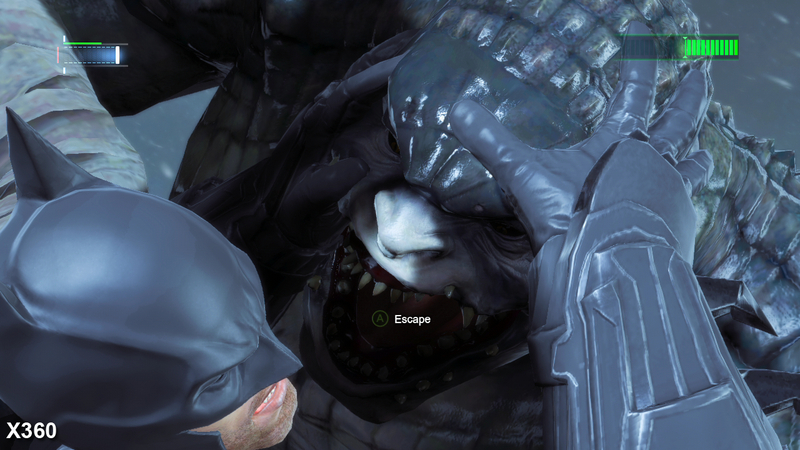 Knightfall on PC and current-gen console. 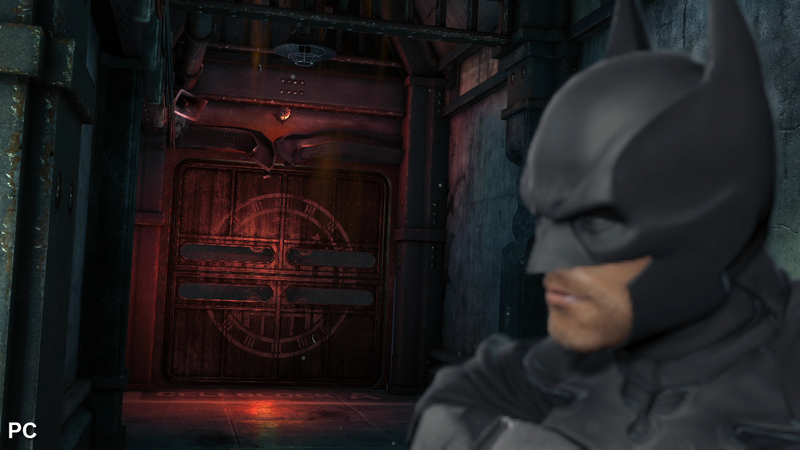 Taking over the reins of the Batman franchise from Rocksteady for this latest instalment, Warner Bros. Games Montreal delivers an entertaining romp set back in the open world-rendition of Gotham first realised in Arkham City. While the game spends most of its time revisiting old ground, the established mix of free-flowing combat, stealth and exploration continues to work well. 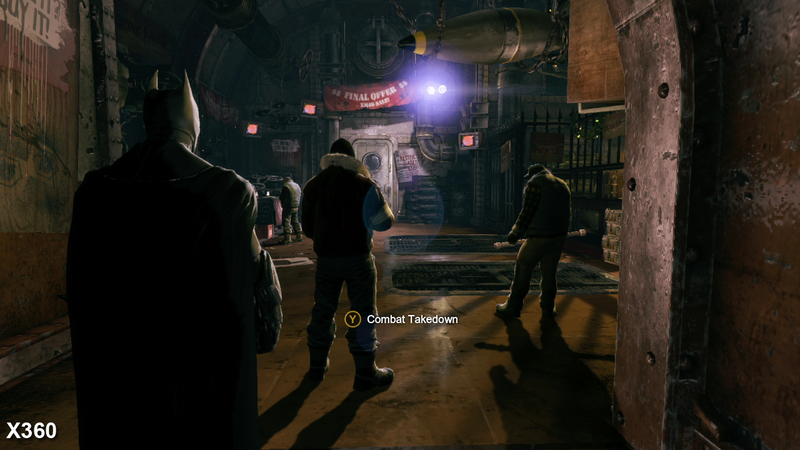 Instead of redefining the series, Arkham Origins expands upon the open version of Gotham present in the previous Batman title, adding in new locations to the existing hub world while also tweaking other areas of the game - the animation of Batman has been improved, resulting in combat that flows a touch more fluidly than before, with the developers promising a more brutal "year two" Batman who has yet to refine his combat skills. In terms of the game engine itself, we see small changes to the lighting model that add more depth to scenes while reducing the harsh glare present from some of the neon signs and spotlights dotted about the environments. The changes are largely beneficial and extend across the majority of platforms, with PC owners getting some tasty PhysX-enhanced extras that further improve upon the game's already solid aesthetic. That said, the situation surrounding the Wii U version is somewhat less pleasing: there are a few more graphical compromises compared to 360 and PS3, while performance lags behind the other formats - not something we'd expect to see at this point in the console's life. 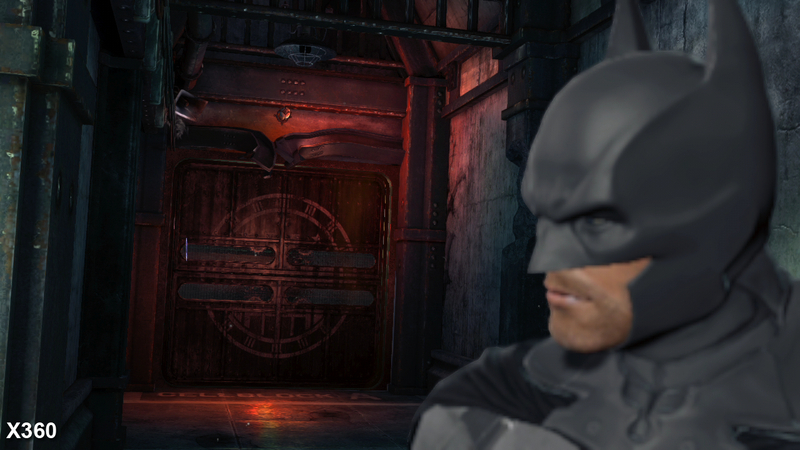 Kicking off with a 360 and Wii U head-to-head video and a quad-format comparison gallery, Batman: Arkham Origins comfortably delivers a sharp native 720p presentation across all three consoles, with the dark, low-contrast nature of the environments reducing the appearance of jaggies and other edge-based artefacts. 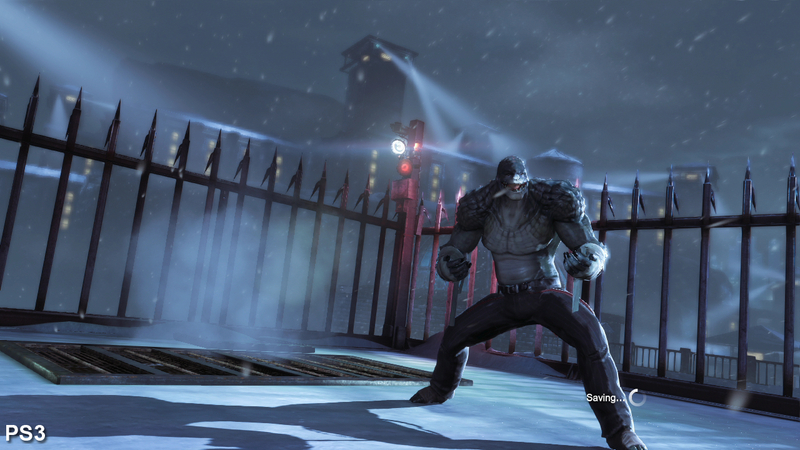 Wii U takes on Xbox 360 in this Arkham Origins comparison - and it's not the most flattering picture for the more modern Nintendo console. 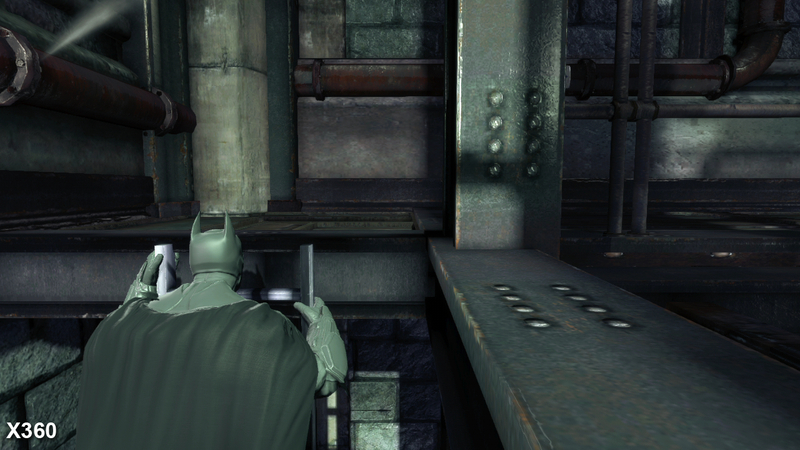 Edge smoothing makes a comeback on the 360 and PS3, with both versions getting different forms of post-process anti-aliasing. 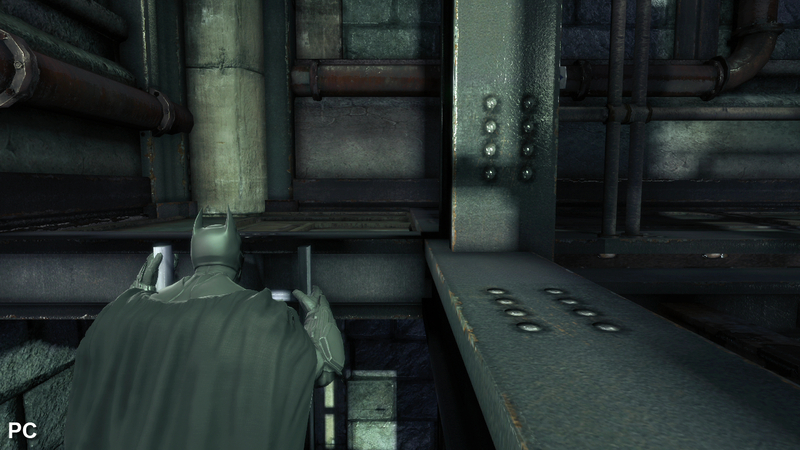 Previously, in Arkham City the use of multi-sampling anti-aliasing was jettisoned altogether, so it's a welcome sight to see an alternative in play here. On a pixel level things appear a tad smoother on the PS3, but in truth we struggled to find any noticeable advantage with both games in motion. In terms of the Wii U game, anti-aliasing is nowhere to be found but outside of some sub-pixel shimmering on distant objects this does little to harm the overall look of the game, so it isn't a big deal and the overall presentation appears comparable to the other consoles. Meanwhile, PC owners get a multitude of anti-aliasing options, consisting of FXAA and TXAA (both high and low variants), along with traditional multi sampling (MSAA), allowing you to the set the bar for image quality while making allowances for performance when running the game on lower-spec hardware. We opted for 8x MSAA, but the improvement in sharpness is not worth the extra performance hit over the use of less demanding solutions. Due to the way sampling is done early on in the rendering pipeline in UE3, many edges actually lack coverage after lighting and other passes have been made by the engine. Using FXAA works almost as well, bar slightly more sub-pixel shimmering in motion, while TXAA impressively eliminates practically all jaggies, but sadly smooths over the artwork a bit too much for our tastes in the process. Streaming issues cause lower-resolution artwork to stay on screen longer on the PS3 and the Wii U. Nintendo's system fares the worst in this regard, while on PC, full detail textures are visible as soon as the level initially loads up. In some places we see a reduction in texture and normal map resolution on PS3 and Wii U compared to the 360, perhaps as a result of the streaming system failing to resolve higher-quality assets. Meanwhile, PC gamers get a boost in artwork quality. Variances in texture filtering are found between consoles. Here we find that the 360 features a subtle advantage, followed by the PS3 and then more obviously on the Wii U.
PC owners enjoy the inclusion of soft shadows, which appear smoother and more refined than those on consoles. 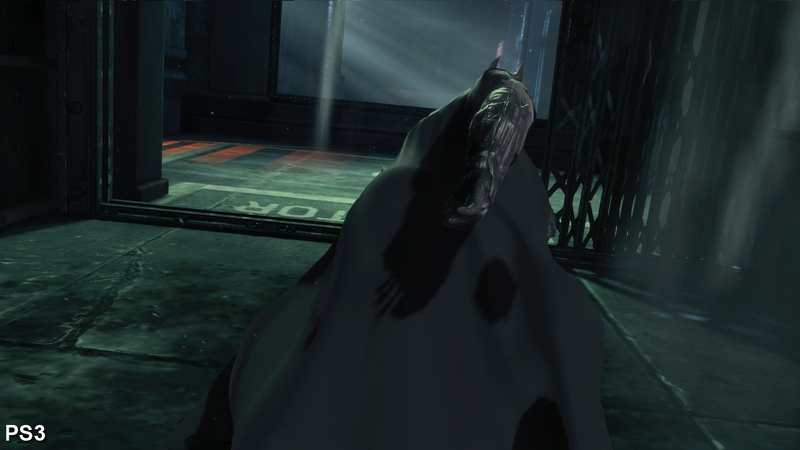 Meanwhile, shadow resolution is a little lower on the Wii U compared to the 360 and PS3. Ambient occlusion makes a welcome return to the series here in Arkham Origins. Standard SSAO is present on consoles, while the PC gets a DirectX 11 variant that appears to be a horizon-based alternative. The effect is fairly inconspicuous on all formats, adding depth without obvious haloing. Between all four platforms, the main point of difference comes down to the way the artwork is handled on each system, particularly where streaming is concerned. A look at our captures reveal that assets are loaded in more quickly on the 360, followed by the PS3 and then the Wii U, with lower-quality artwork left on screen for longer on Nintendo's system. There are also a few cases where lower-resolution art is deployed on the PS3 and Wii U on a permanent basis, but thankfully this is only appears to be apparent on some minor background objects and thus doesn't stick out too noticeably when playing the game. The appearance of reduced levels of texture filtering is a little surprising on Wii U - something which also afflicts the PS3 game but to a lesser extent - as are the inclusion of lower-resolution shadows. Perhaps the developer struggled with overall bandwidth consumption on the platform with regards to texture reads from DDR3 memory (bandwidth-heavy tasks are mostly likely done using the system's 32MB ESRAM), or that they simply didn't have the texture units available. This would certainly help to explain why the appearance of particle effects and heavy alpha have a greater impact on performance than on other formats in many Wii U games - not just in Arkham Origins. 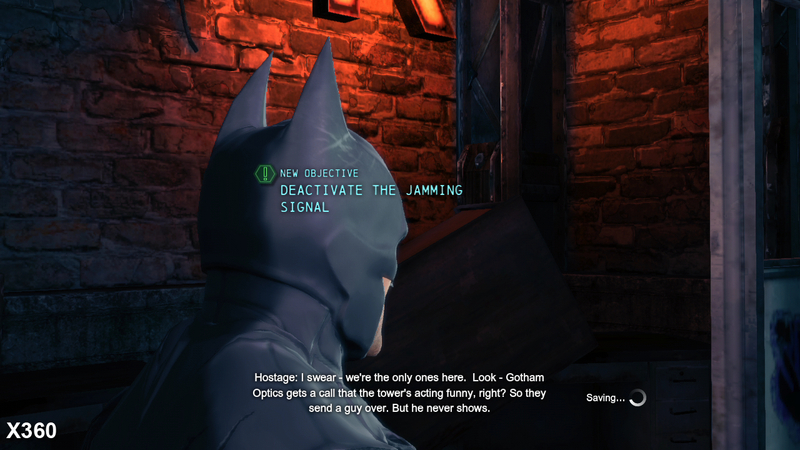 Once the bulk of the artwork has finished loading and gameplay is under way, streaming is largely identical across all platforms - including PC - with the previous issues of textures popping up a few seconds later on the PS3 in Arkham City completely reduced to the initial loading at the start of a new area. 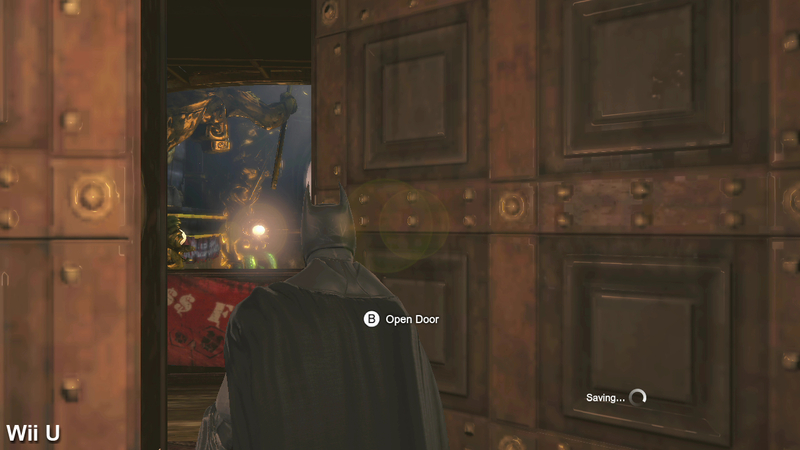 The appearance of visible pop-up on PC is a bit of a let-down, given how well hidden level-of-detail transitions were in Arkham City, but higher-quality assets are used for lower-level LOD models, which makes the switch a little less jarring. Smoke and particle effects are of the flat alpha-blended variety on console, but on PC these elements add a volumetric component to them giving them considerable depth and three dimensionality. 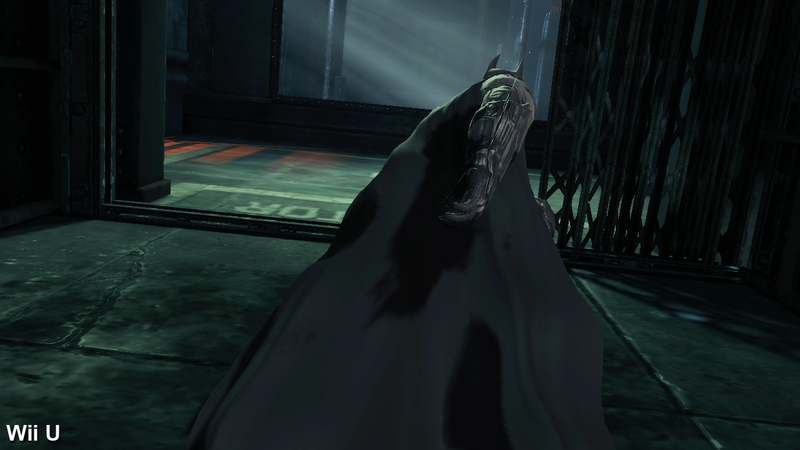 Tessellation is used sparingly throughout the PC version of Arkham Origins. Here we can see how the effect is used to add undulating surfaces in the snow. 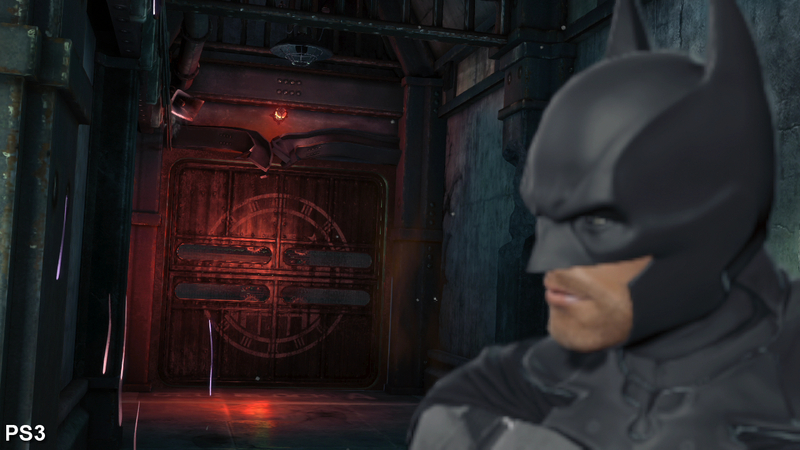 Some of the character models are highly detailed in Arkham Origins. Surprisingly, tessellation isn't used here to add more detail on PC because the base model already features a high level of geometry complexity. Higher-resolution depth-of-field is present on the PC. 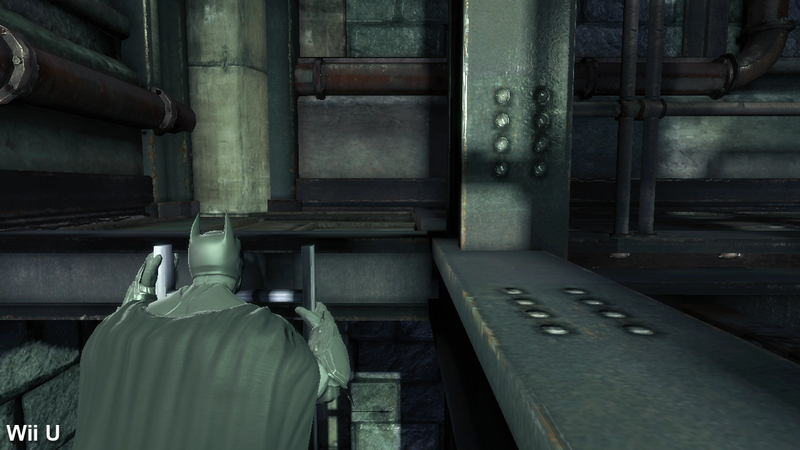 Notice how the effect creates jagged edges around the character and other objects within its radius on the consoles. 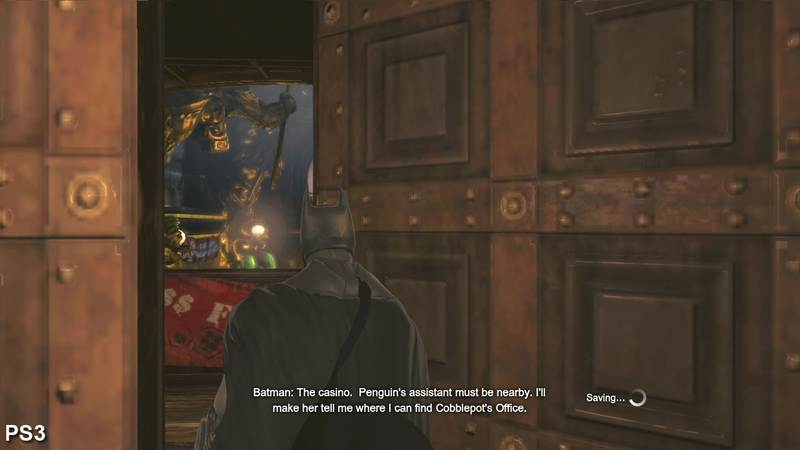 On the PC version, Arkham Origins benefits from featuring extra debris and objects scattered across the environment compared to the consoles. 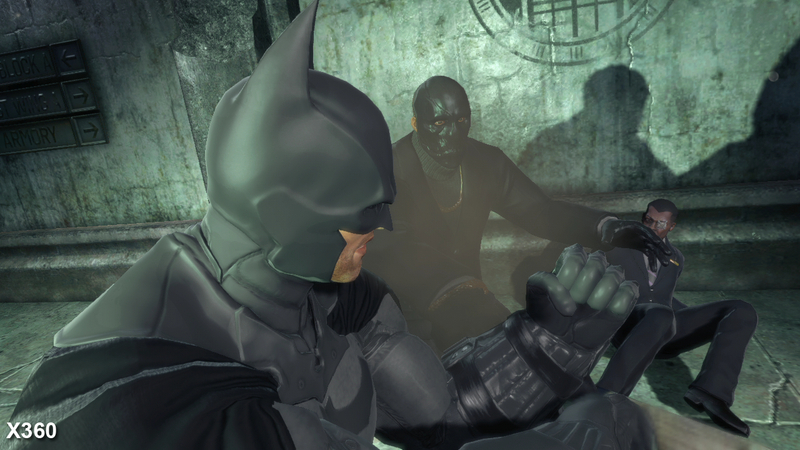 Naturally, PC owners get visibly higher-resolution textures and normal maps, although the artwork on Batman's suit and skin doesn't appear quite as detailed compared to Arkham City. The use of higher-resolution depth-of-field and object blur effects are also present over the console versions, along with the inclusion of soft shadows and the addition of extra debris, objects, and alpha-based effects scattered across the environment. 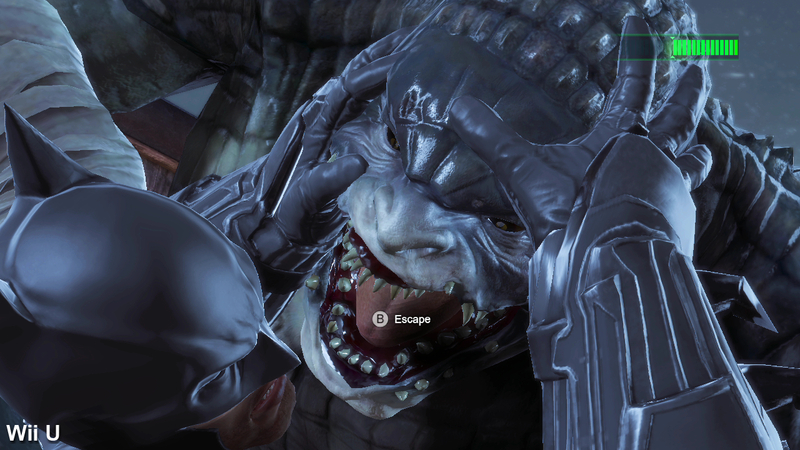 The level of ambient occlusion is stronger than the console versions too, with the PC's DirectX 11 enhanced HBAO implementation featuring a wider radius of coverage than the cheaper SSAO variant used on the 360, PS3, and Wii U. On top of that we have a string of DirectX 11 enhancements on PC designed to add a few next-generation style features to boost the overall presentation beyond higher-quality art and larger pixel counts. 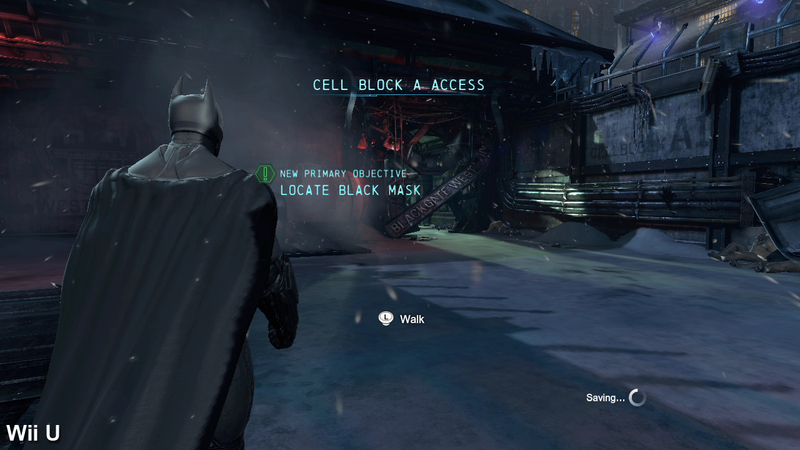 The first of these meaty extras is the use of tessellation to create more detailed footprints as Batman moves through the snow, and to make a few select parts of the environment appear a little smoother than the current-gen machines. The most prominent upgrade when moving to the PC version is the inclusion of volumetric smoke effects and particle physics, enhanced by the PhysX middleware exclusive to Nvidia cards. 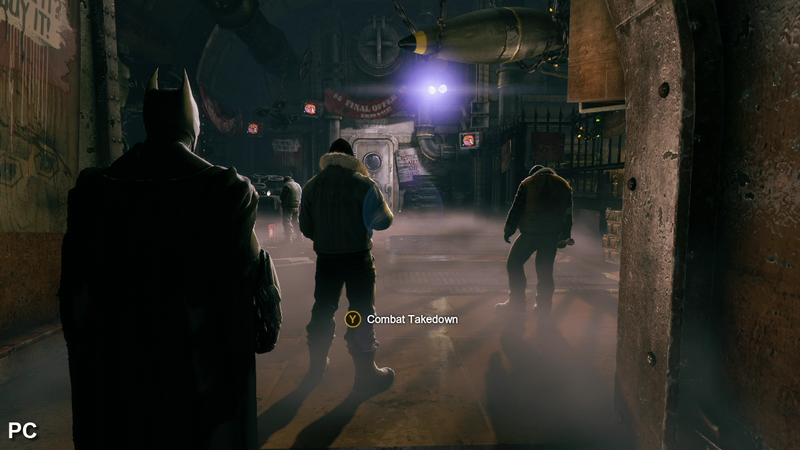 Here we find thick layers of smoke and mist flowing through broken pipes and cracks in the environment which react realistically to Batman and other characters when they collide with these elements, along with snowflakes that dance around in the air according to the direction and velocity of the wind. 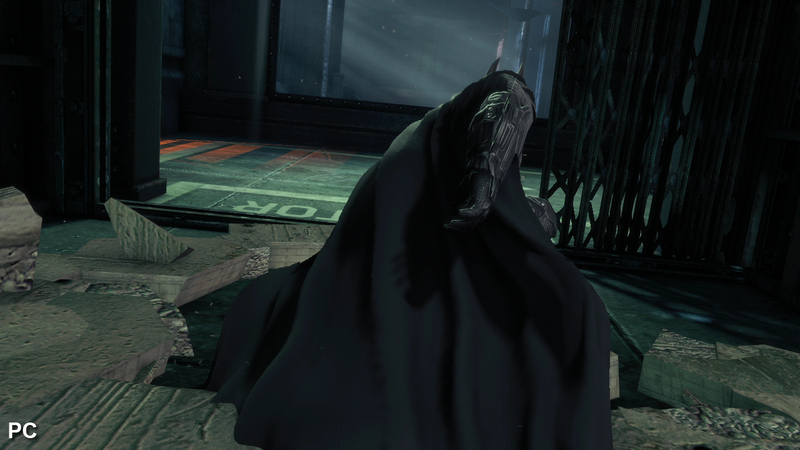 Real-time cloth simulation provided by PhysX is also applied to Batman's cape and the various hanging banners dotted around Gotham, which sway and crease up as they blow in the wind. 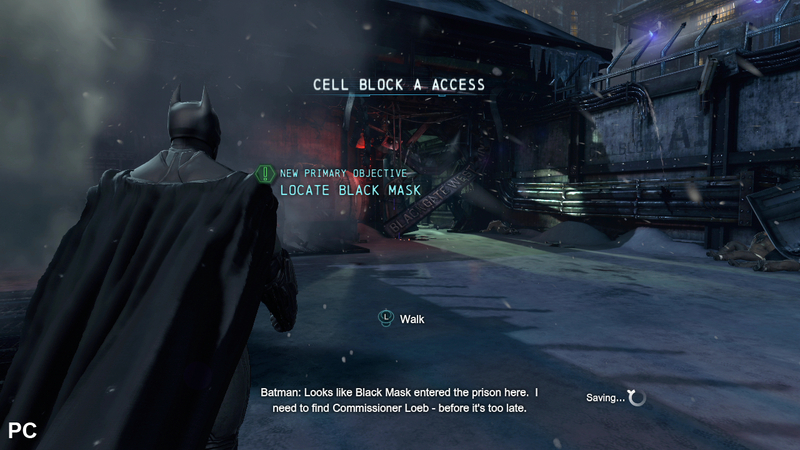 "Arkham Origins sees the introduction of a range of Nvidia-exclusive PC technologies, including TXAA and some very nice PhysX work." A promotional video, demonstrating some of the PC-exclusive features found in Batman: Arkham Origins. 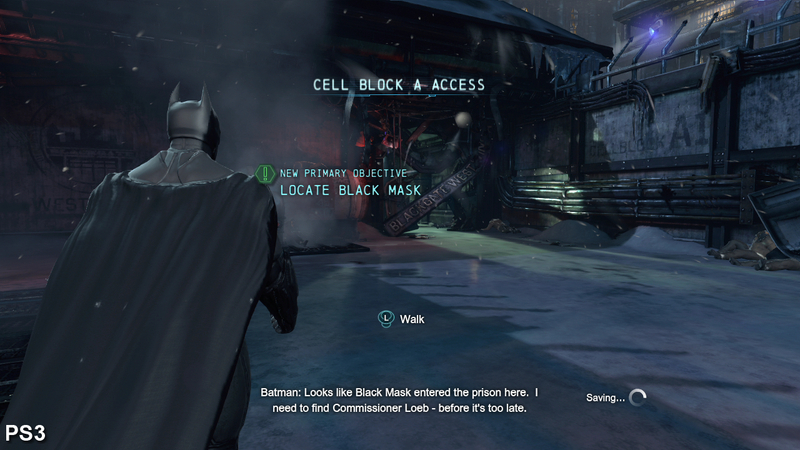 The only downside to enabling these features is a hefty performance hit when playing in 1080p. In this respect we'd highly recommend use of a second GPU to drive the PhysX-based effects for 1080p60 gameplay if you're planning to use MSAA. Of course disabling PhysX - or simply selecting high-quality FXAA - means that a near-locked 60fps is easily achieved without needing anywhere near that level of raw grunt - our trusty Core i5 3570 and GTX 680 had no problems doing this outside of a few minor dips when faced with more detailed locations in the central hub world. 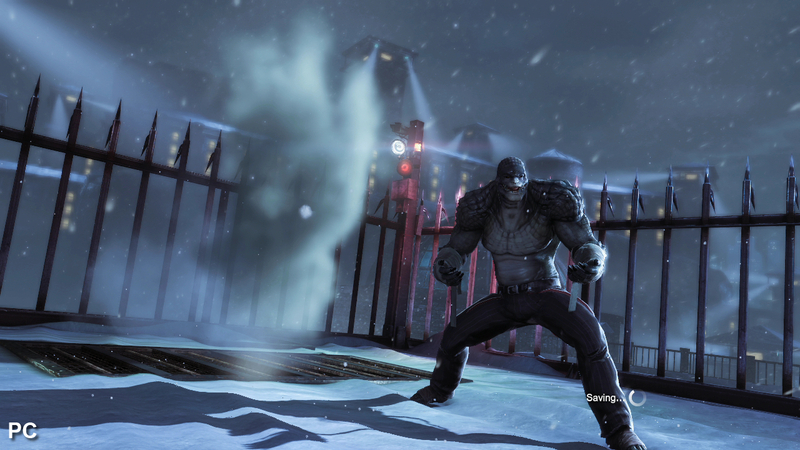 UE3 titles are generally easy to run, and nothing has really changed in this regard with Arkham Origins, as long as you don't go overboard with some of the more exotic features. On console, Arkham Origins sticks with the series' standard 30fps. 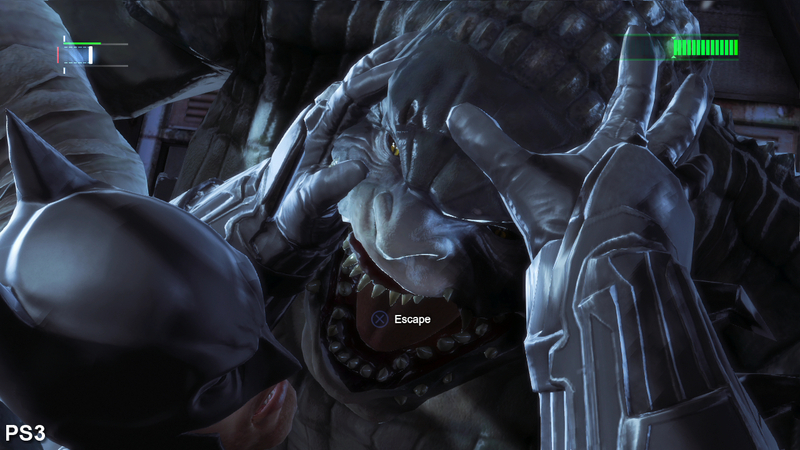 In terms of the Microsoft and Sony platforms, compared to Arkham City the amount of screen tearing is visibly reduced when the engine isn't being pushed to its limits, although a noticeable gap in frame-rate is evident in certain situations, with the game's streaming system causing a few hiccups when traversing the environment. For the most part the experience sticks very closely to 30fps on the 360, although the game isn't immune to the mild bouts of tearing and drops in smoothness when exploring the open hub world. The PS3 is often very close, but combat-heavy scenes set in more detailed environments sees the engine falter on Sony's system, dropping frames and producing screen-tear. In comparison, smaller battles come across as rather smooth and comparable to the Xbox 360 experience. 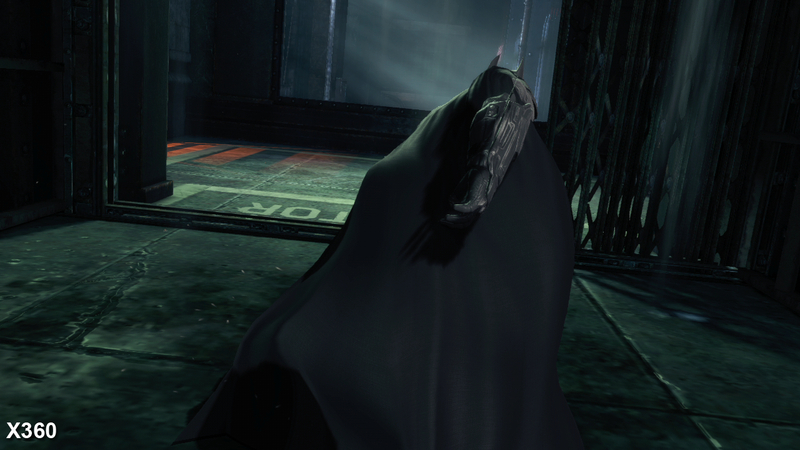 It's a shame that performance is so poor on the Wii U version of Arkham Origins as the hardware has the potential to deliver the most interesting Batman experience due to the system's unique GamePad controller. 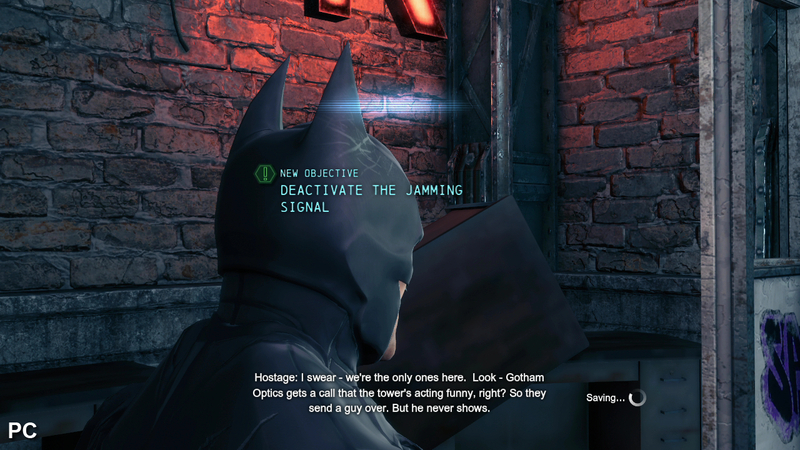 Many of Batman's gadgets employ the use of a touchscreen in the game, so are well suited for mapping to the GamePad's use as a second display and touch device. 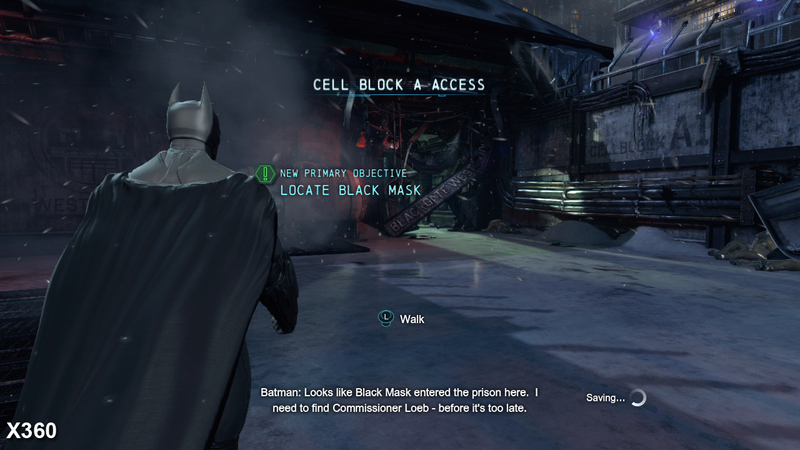 However, functionality is actually limited to only a handful of features and there are fewer GamePad options available compared to Arkham City. 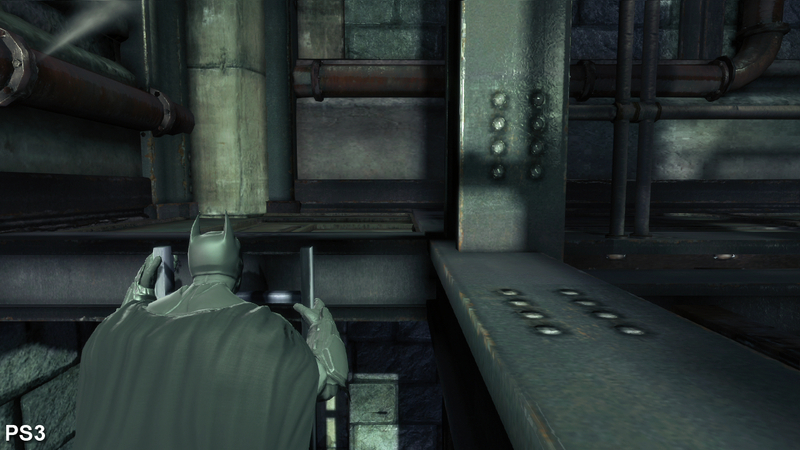 In Origins, the bulk of GamePad functionality is mainly limited to map usage and in controlling your crime scene scanner, which involves moving the controller around in order to follow the highlighted trail on the LCD screen. 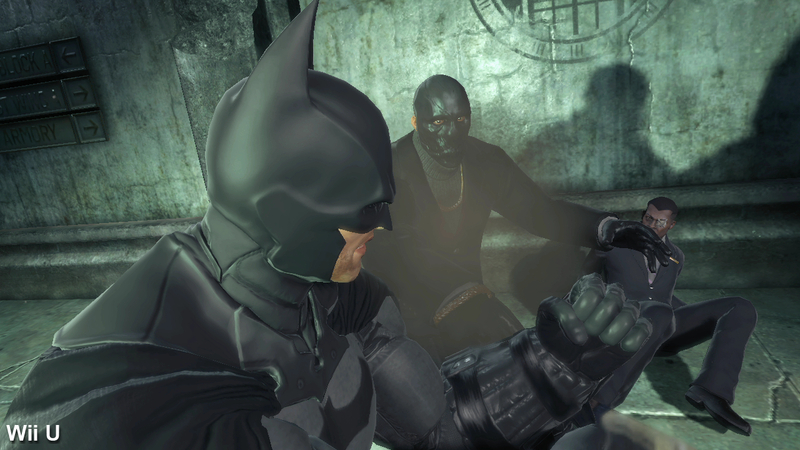 Sadly, other gadgets that see Batman utilising a custom Wayne Tech tablet and similar devices, are left completely untouched from the standard versions of the game. 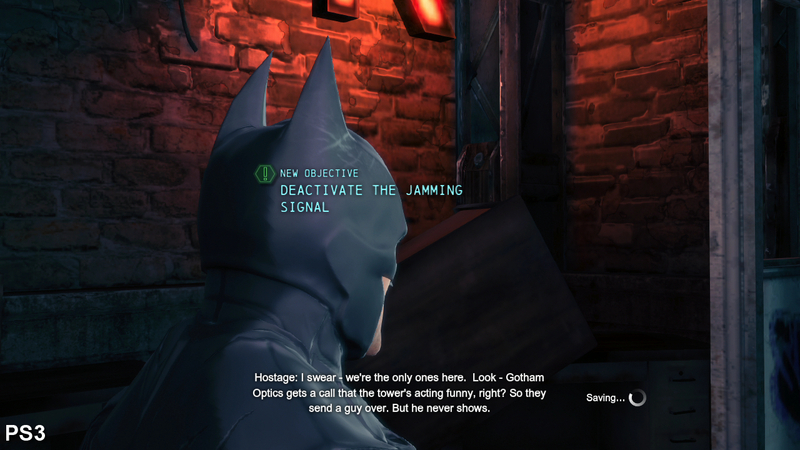 In addition, the weapon select and levelling menu options are no longer present in Origins using the GamePad, and the decryption sequences are restricted to traditional controls only - all features given exclusive GamePad support in Arkham City. 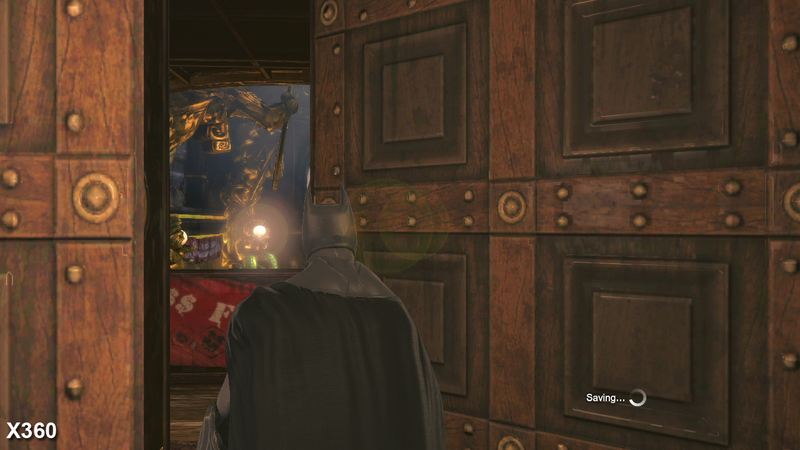 Lastly, the new multiplayer mode present in the 360, PS3, and PC versions is completely absent from the Wii U game. It's a disappointing state of affairs overall, giving gamers little incentive to go for the Nintendo option over the established current-gen consoles. The situation is considerably worse on the Wii U. 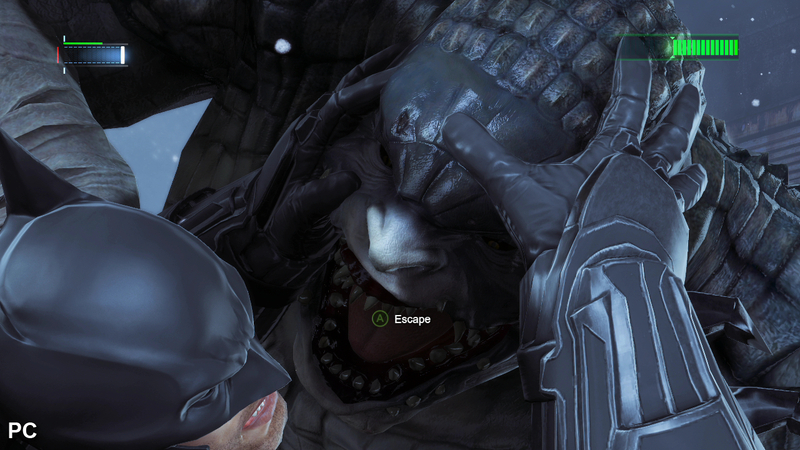 On the plus side, screen-tearing is completely eliminated due to the inclusion of a locked v-synced presentation, but disappointingly the result of this is a frame-rate that fluctuates somewhere in the mid-twenties on a regular basis, producing constant judder and a serious reduction in the responsiveness of the controls. The number of enemies and the inclusion of a weaker CPU seems to be the cause for this on Nintendo's system - perhaps the console simply can't keep up with handling all of the AI and physics routines under load. The result is that gameplay is heavily compromised to the point where we found the experience far less enjoyable as a result. At times the PS3 version suffers to a similar degree, but this happens far less frequently compared to the Nintendo platform. Issues also arise when traversing the environment. While the 360 manages to mostly stick closely to the desired 30fps target, both the PS3 and Wii U drop significantly when exploring detailed locations with extensive draw distances. Most notably we encountered pauses of several seconds a handful of times on the Wii U game throughout our playthrough, contained amongst the heavy frame-rate drops. At these points, we heard the console's disc drive frantically chugging away - as if it was trying to keep up with streaming in the large amounts of data required to generate the moderately large environments. The problem of steaming data fast enough from a Blu-Ray disc also appears to cause performance issues on the PS3 - albeit to a much lesser degree than on Wii U - and that's despite the mandatory 4603MB installation. 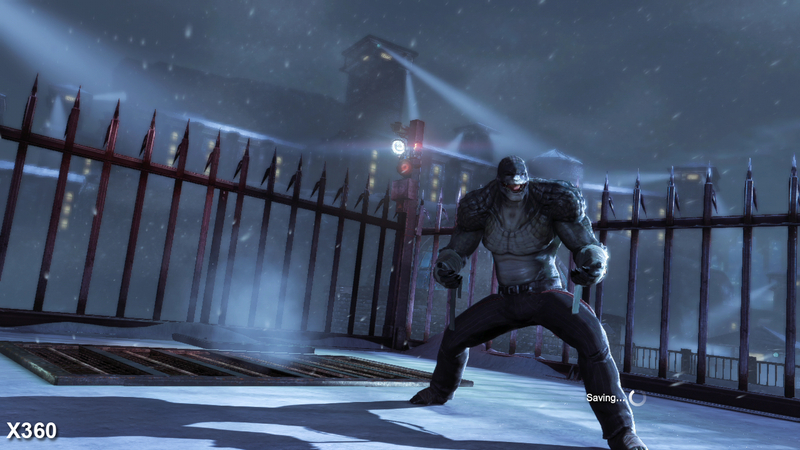 Overall, the end result is that Arkham Origins is smoother and more consistent on the 360, with the PS3 game delivering a similar experience to Microsoft's console, bar the more inconsistent frame-rate drops during heavy combat and traversal. Both manage to achieve far more stable performance than Nintendo's console, which comes across as erratic, and even occasionally broken when random freezes occur as the engine struggles to stream assets out for display. "Despite its more modern GPU, it's clearly the Wii U version that suffers most in terms of performance - v-sync dragging the frame-rate down." Cut-scene comparisons allow us to view game engine performance in like-for-like scenarios and we see a clear three-tier frame-rate divide - 360 is smoothest, followed by PS3, then Wii U. There are few surprises left when it comes to multi-platform releases on the current-generation consoles - especially where Unreal Engine 3 is concerned. 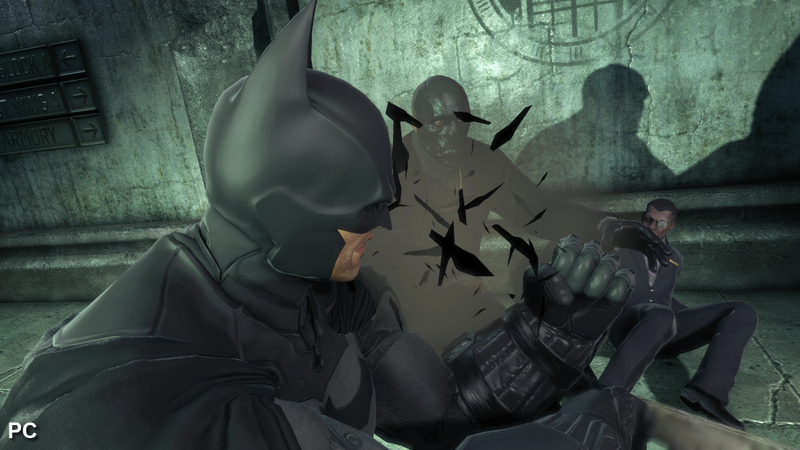 Rocksteady's absence might have resulted in a experience that doesn't push the bar forward for the Arkham series, but the team at Warner Bros. Games Montreal has still done a great job at creating another strong Batman game that is well worth consideration. The engine enhancements also work well in producing a cleaner, more refined image, with the return of anti-aliasing and ambient occlusion in the 360 and PS3 versions standing as welcome additions to the solid range of graphical features on offer throughout the game. The conversion work is generally solid too where the 360 and PS3 are concerned, although some of the frame-rate and stuttering issues on Sony's system do distract from the action when the engine is put under stress, and some of the srteaming issues across all formats are perhaps indicative of the UE3 technology being pushed to its limits. Unfortunately, the Wii U once again disappoints with considerably worse performance than the other formats. This is a shame, as the use of lower-resolution shadows and greater texture streaming problems could all be overlooked if the game ran far more smoothly. The pared-back GamePad features and the lack of multiplayer also comes across as a disappointment, making this version hard to recommend if you own multiple platforms. 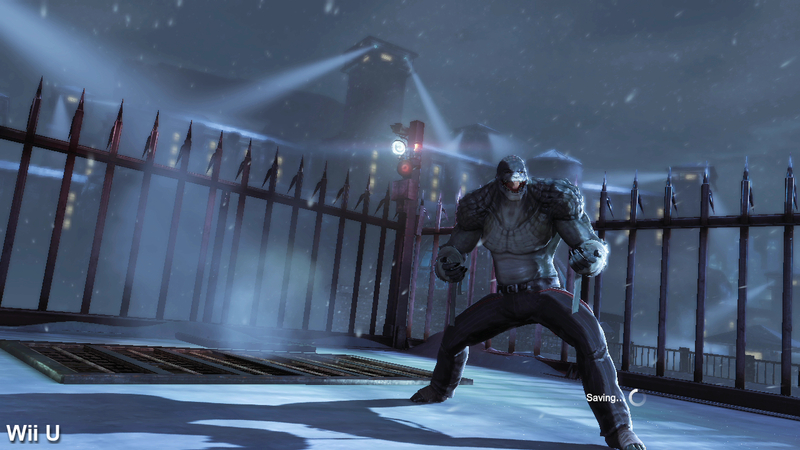 On the whole Arkham Origins is a fitting finale to the series on the older consoles, before Rocksteady returns with a Batman title designed for next-gen. While it's less innovative than the first two instalments, the solid combat and familiar mix of stealth and action-based gameplay is well worth investigating. 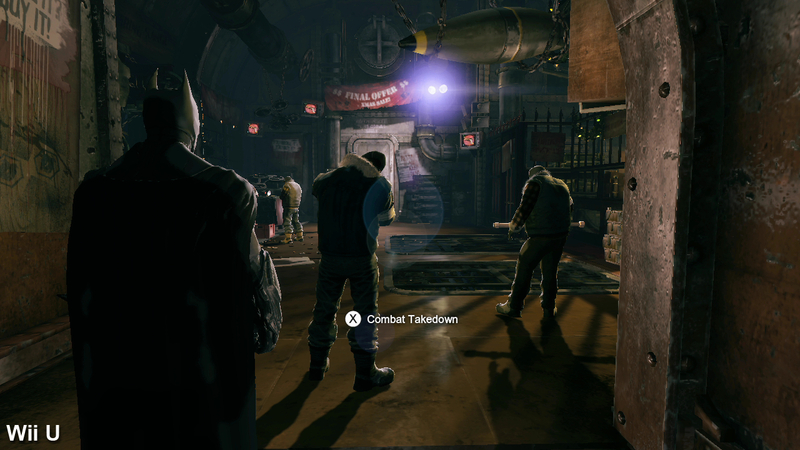 While Xbox 360 arguably offers up the smoothest gameplay experience on console, PS3 owners get exclusive DLC that includes the Nightfall challenge maps and extra Batman costumes based on the 1960s TV series and the classic comics' Knightfall story arc. Given the major frame-rate issues it's hard to recommend the Wii U game at all unless you have no other option. Meanwhile, as expected, the PC version stands alone in terms of performance and quality features, making it the default choice for enthusiast gamers.